Description: Dwarf shrub, sometimes almost prostrate, glabrous or slightly pubescent; rootstock slender. Leaves linear to narrow-oblong, 5–20 mm long, 1–1.5 mm wide, apex acute and entire or apically 3-toothed, margins flat to recurved, often thickened to lower surface, sparsely hairy, becoming ± glabrous. Flowers solitary or 2 or 3 together, terminal or subterminal; pedicels 2–3 mm long, glabrous to pubescent. Sepals c. 2 mm long, sparingly ciliate. Petals 3–7 mm long, white often with mauve on outside. Capsule ovoid to broad-obovate, slightly compressed, 4–6 mm long, 5–8 mm wide, thinly leathery, glabrous, pedicel decurved or deflexed; style persistent. Distribution and occurrence: Occurs west to Griffith district. 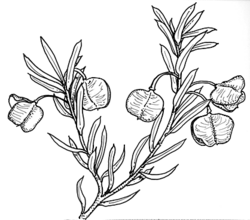 Grows in heath, scrub and sclerophyll forest on sandstone, granite, or metamorphic substrates.